I didn’t want to jump on the “New Year, New Me” bandwagon because, to be honest, I don’t think you need a new year to make a change in your life that will benefit you. That said, I do want to make 2018 the year where I am a little more comfortable going without makeup and, of course, that starts with a good foundation; no, not the type I layer on, the one below that, my skin. 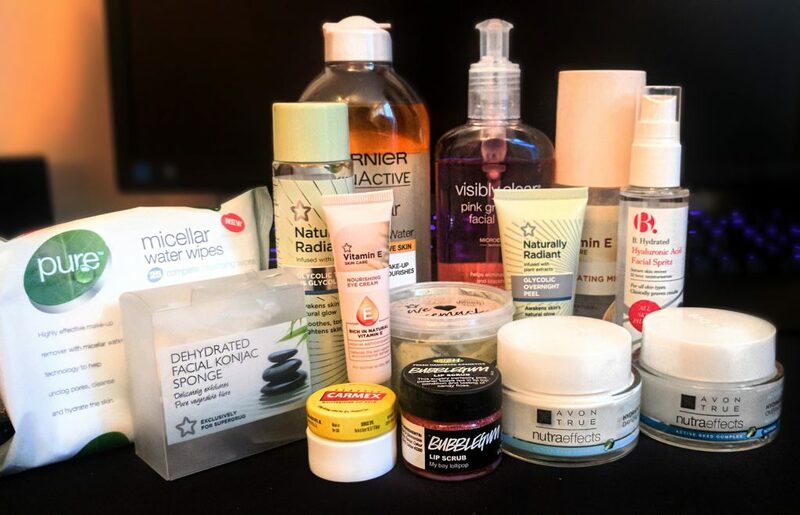 In recent years I have been trying to take better care of my skin and use products that I know not only suit it but benefit it too, but I just didn’t feel that my skincare was enough, which is why I’ve decided to change things up and add an arsenal of products to my routine. My biggest skin concerns are redness, especially on the cheeks and chin; like broken capillaries/weather damage and ageing. People tend to laugh at me when I say ageing, but it’s all about how you feel about yourself and, with each passing year, I am getting closer to getting Botox. I have frown lines on my forehead, visible “laughter lines” around my eyes and the jowl area is becoming more noticeable. I also have noticed that my eyes are becoming more hooded and, more than the wrinkles, that bothers me. However, while my “Filler Fund” is currently non-existent (but it will happen one day), I have decided to try and minimize further damage to my skin, as well as try to make it look a bit healthier and happier and, as a result, I have embarked on a totally new, and perhaps, to some, a little excessive, skincare routine. Before I launch into the order in which I use the products, I will tell you a bit about each of them. If you are just interested in the routine and why I chose the specific products, please scroll down to the paragraphs below the product picture. This sugary, perfectly pink polisher keeps the lips in tip-top condition and tastes of candy floss. Highly effective makeup remover with micellar water technology to help unclog pores, cleanse & hydrate the skin. Alcohol-free, fragrance-free, paraben free, enriched with aloe vera. The unique texture of the konjac sponge delicately exfoliates and cleanses, while helping to stimulate the circulation, leaving the skin feeling soft, smooth and refreshed. The weak alkalinity of the konjac sponge may also help maintain a healthy skin PH. Vegetarian & vegan-friendly. An Oat-ally marvellous creamy mixture! We love Avocado & Oat facemasks; this fabulous concoction will help add a burst of goodness to your skincare routine. Vitamin E Nourishing Eye Cream is a light and non-greasy formulation that contains Glycerin and a naturally active energising complex to nourish and help improve the appearance of the delicate eye area. Micellar Oil-Infused Cleansing Water is an easy way to remove even waterproof & long wear makeup, and cleanse and nourish the feel of the skin, in 1 step without rinsing. For the 1st time, Garnier Micellar technology is formulated with nourishing oils. The micelles (cleansing agents) capture impurities like a magnet & lift away dirt from the skin, whilst the oils instantly dissolve all types of makeup. An uplifting daily facial cleanser for clear, fresh and healthy-looking skin every day. With powerful MicroClear Technology, the formula cleanses deeply to help eliminate spots and blackheads. Naturally Radiant Glycolic Tonic is formulated with a unique energising complex and infused with Kiwi Fruit and Mulberry extracts to help revive skin’s radiance and even out the skin tone. Highly concentrated in Glycolic Acid (5%), a powerful Alpha Hydroxy Acid (AHA), the refreshing tonic also refines pores, retexturizes the skin’s surface and smooths fine lines, providing a brighter, healthier and more youthful complexion. Naturally Radiant Glycolic Overnight Peel is formulated with a unique energising complex infused with Kiwi Fruit and Mulberry Extracts to help revive skin’s radiance and even out skin tone. With Glycolic Acid, a powerful Alpha Hydroxy (AHA) and a Fruit Acid blend, the refreshing gel formula also refines and retexturizes the skin’s surface, providing a brighter, more youthful complexion. Hyaluronic Acid Facial Spritz to rapidly replenish the skin and lock in moisture for 12 hours without clogging pores. A skincare essential, ideal for use while travelling, or to refresh makeup and hydrate tired skin for a smoother look. Vitamin E Hydrating Mist with soothing Aloe Vera instantly revitalises and tones the face, giving a boost of moisture with each spray. Enriched with naturally sourced Vitamin E, a powerful antioxidant that will help to shield your skin against environmental damage and premature skin ageing by combating the harmful effects of free radicals. The replenishing formula also contains a skin conditioning multivitamin complex, comprising Vitamins A, B, F, and H which, combined with Horse Chestnut Extract, helps to care for dry skin. Oil-free moisturiser for 48-hour hydration and broad-spectrum SPF15 protection. Formulated with Avon’s Active Seed Complex with chia seeds to help keep skin moisturised for 48 hours and replenish nutrients for visibly healthier looking skin. Contains chia seeds that are known to hold up to 12x their weight in water, to help keep skin moisturised. Now, I know that is a lot of products and, no, I don’t use them all at the same time. I start by using the Micellar Wipes to remove the majority of my face makeup. I then use the Garnier Micellar Water on the eyes as I find it gentle but effective in removing mascara (and eyelash adhesive residue). Then I move into the bathroom and I start off with my Makeup Revolution Pro Makeup Eraser Towel (available here). I love this towel because, even if I haven’t used the Micellar products, it is a really gentle and effective way to remove all makeup. Before I started this regime, this was the first step in my cleansing routine. Once I’ve removed any leftover products with the Towel, I wash my face with the Neutrogena Facial Wash. I was using the Visibly Clear Pore & Shine Daily Wash, but I found that a little too drying for my skin, possibly because I don’t tend to suffer from excess sebum. I have, however, found the pink grapefruit wash to be much more suited to my skin’s needs. After rinsing my face with clean, warm water, I use my Konjac Sponge in small circular motions all over my face (avoiding the delicate eye area). I have to say, this was the product that gave the most instantly obvious result. My face, even after just 1 use, felt so much softer and smoother. I used to use a facial scrub once or twice a week but, since moving onto this sponge, I no longer need to use that (and I also used to find it could be a little too harsh on the skin). I would completely recommend the Konjac Sponge to anyone who exfoliates regularly, or even if you don’t because you will notice a difference in your skin’s overall condition. I find this sponge gentle enough to use every day, whereas, with other exfoliators, if I used them more than twice a week it was too much for my skin and seemed to increase sensitivity and/or dry it out. Mondays, Wednesdays & Fridays: I use the Glycolic Tonic, smoothing it over my skin with a cotton pad. This product also makes a very effective toner, as I have noticed that it removes the very last of any products that all of the above steps may have missed. I then follow it up with the Glycolic Overnight Peel. Now, the name of this product is slightly misleading. I expected this to be some sort of peel off facemask – it isn’t. You wash it off in the morning. I just rinse my face with warm water. On Tuesdays, Thursdays, Friday, Saturday & Sunday I do still use the Glycolic Tonic, but I then follow it up with a generous spray of the Hyaluronic Spritz. The following is done every day, regardless of whether I’ve worn makeup or which of the above routines I’m following. I apply the overnight gel cream and the Vitamin E eye cream. I have noticed an incredible difference in my eye area in just over a week of using the eye cream. It has left the area a lot softer and a lot less “stressed” looking. In the mornings I use the Avon Day Cream, regardless of whether or not I’m wearing makeup. If it is a makeup day, I cleanse my face with the Micellar Wipe before I start prepping my skin for makeup. If my skin is having a tired day I will use the Hyaluronic Spritz as a pre-primer step. I have been using the Vitamin Hydrating Mist as an “as and when” product. Very often, after using my setting spray, I will follow up with the Mist, and I have found it has even added longevity to my makeup. On days when I don’t wear makeup, what happens at night really does depend on how I’m feeling. I will cleanse either using the Micellar Wipes (I won’t use the Garnier Water when I don’t have makeup on), or I may use the Eraser Towel, as I love the feel of it when I have used warm water on it. If I’m having a prolonged period of not wearing makeup, I will use the Pink Grapefruit wash every other day, and also the Konjac Sponge every other day. The one thing that remains constant, regardless of whether or not I’ve worn makeup, is the daily tonic and moisturiser routine. I tend to use the Lip Scrub once a week but, if I have been wearing a lot of matte lipsticks or liquid lipsticks, I may use it midway through the week as well, just to help breathe some life back into them. The Carmex however, gets used multiple times daily. I have pots and tubes of it all around the house so that I am never far from lip hydration. I have used plenty of other lip balms, etc., but none of them makes my lips feel quite as happy as Carmex does. With regard to the facemask, I have only used it once so far (because I got it this week). To be honest, the smell of it made me gag. It just smelled like bad avocado. But I persevered and smoothed it over my face, oaty lumps n all. I left it for approximately 15 minutes, by which time it felt “stiff” where it had dried down. I used warm water to emulsify it and then worked the again creamy mask in circular motions. The oats provided a gentle exfoliation without leaving my skin feeling dry and tight. When I dried my skin off it actually felt moisturised, looked glowy and healthy and actually felt “plump”. Now, I have never understood how skin can feel “plump”, until last night when I used the mask. My skin had an elasticity and, almost a “bounce” to it and it just felt awesome. I followed it up with the hyaluronic spritz routine and, today, my face still looks and feels just as nice as it did when I removed the mask. No, I can’t stand the smell of it, but I can stand the results. Looks like a nose peg might be in order for next time. That brings me to the end of my rather long-winded skincare blog, but I hope you found it interesting. As always, this is my way of doing things and what works for me. There is no right or wrong way to do a skincare routine, do what works for you. * All of the views expressed in this post and on this site are mine and mine alone. * This is not a sponsored post. All of the products mentioned and pictured are mine and were bought and paid for by myself. * I am in no way financially involved or affiliated with Superdrug, Avon, Lush, or any other Companies mentioned in this post, nor with any of their employees. * Any photos in this post are mine and were taken by me. Please do not use, edit, post or otherwise take my photos without first obtaining my express written permission.